Well now, T.I.M.E Stories just got interesting again. 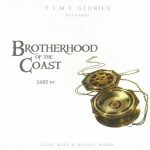 After a few up and down expansions for T.I.M.E Stories, Brotherhood of the Coast arrived and has given the goalposts a hefty kick in the right direction, leaving behind a few hours of one of the most gripping and intriguing missions you’ll find amongst the eight so far on offer for the base game. Without dropping any spoilers it’s going to be hard to explain quite why this is such a good mission, but we’ll dive in and see what we can do. There are, as is usually the case in a new expansion, some new gameplay dynamics on offer here. The most obvious and extreme though comes in the form of an additional board that positions itself above the main board and allows for various new things to play out, bringing in elements that obviously haven’t been looked at previously. There are also a lot of cards here, 5 packs in total, giving you locations that you can explore within other locations; the area this game is based in is pretty small, but don’t think there’s not much exploring to do. There’s a lot to look out for, and as if that wasn’t interesting enough, there’s all the decisions you need to make. While not exactly a Choose Your Own Adventure style game, there are a fair few choices to make that will have an impact on how your run through Brotherhood of the Coast pans out. That’s something we haven’t really seen much in recent expansions, and it’s a really nice mechanic to have mixed in with the usual elements of exploring, fighting and puzzle solving. Speaking of which, there’s a fantastic mix of those three things on offer here – that’s not to say every encounter or moment of exploration is fantastic (although it’s not far from it) but the balance seems spot on. Not excessive amounts of combat (you can often choose to try and avoid fighting too), and not so much exploring that you’ll run out of time before getting anywhere, but enough to make a one or two run finish practically impossible. The puzzles are good fun too, and with some stories having been quite light on this aspect it’s really cool to see this back; hopefully the next expansion which would appear to be based in the future will maintain this balance of different game styles because it made this one great to play. It’s also a really nice touch that your final couple of runs will vary greatly depending on what you’ve managed to accrue along the way, and those teams with a well prepared arsenal of ships and weapons will probably have a slightly easier time of it, although popping back for a couple of helpful items is always an option, such is the beauty of the system used in the game. It’d be no surprise to learn that the artwork on the cards is great too, continuing the string of very impressive looking illustrations seen throughout the T.I.M.E Stories library of missions. The cards are clear and accurate – we didn’t find any typos or weird translations this time – and the whole package feels like it’s had a lot of care and devotion given to it, more so than one or two of the other expansions. Is this as a result of some feedback from players? Who knows, but whatever the reasons it’s great to see it happening, and long may it continue. One thing that’s worth keeping in mind though is that there’s a longer reaching storyline going on throughout the expansions, which is built on each time round. As such, and being eight stories in, you’ll get more from this if you’ve played the previous missions already. It’s not essential, and you won’t be massively missing out if you’re jumping straight into this, but there are certainly advantages to playing them through in order and this is no exception to that rule. If you jump to this you’ll also be missing out on expansions like Lumen Fidei and Expedition Endurance which were both awesome as well, so it’s worth getting as many as your wallet/bank/partner will allow. So Brotherhood of the Coast gets T.I.M.E Stories back to where it should have been all along, delivering exciting and fascinating missions and some new tricks to mix things up and make it interesting again. It’s one of the better expansions without a doubt, and if you’re a fan of the series this should be a no-brainer.